Are you looking for a flooring upgrade that is both stylish as well as durable? Visit our showroom to check out our huge variety of luxury vinyl flooring suitable for every room in your home. Our luxury vinyl tile and plank style flooring comes in a wide variety of appearances, colors, and sizes. When you want durability and style without breaking the bank, choose luxury vinyl flooring. Stop by our showroom and discuss your current project with one of our knowledgeable and dedicated flooring professionals. We’re able to provide advice and guidance so you can choose the best LVF to suit your home’s current décor and style needs. 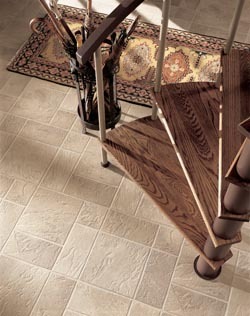 Be sure to schedule luxury vinyl flooring installation to protect your new investment. In addition to its versatile appearance, price, and durability, luxury vinyl flooring is one of the easiest flooring types to maintain and clean. Like most people today, your schedule is likely full of work, family, and social needs, leaving very little time for solitary relaxation or house cleaning. With luxury vinyl tile or plank flooring, your home cleaning routine becomes much simpler. Vinyl doesn’t absorb dirt or liquids, so it’s easy to clean up spills and other messes. LVF is an excellent choice for anyone living on their own or even large families with several children and pets. Are you in love with the look of hardwood but not the price tag or maintenance requirements? Luxury vinyl plank is the ideal way to enjoy the classic and elegant appearance of hardwood floors while enjoying the durability, price, and easy maintenance requirements of vinyl. Because vinyl is a printed material, it is available in virtually any appearance from hardwood to natural stone and other patterns. Whether you prefer the look of dark oak or white marble, we’re sure to have a type of luxury tile or plank flooring to suit your taste. From the kitchen and bathroom to the dining room and bedrooms, luxury vinyl flooring is an excellent choice for any room in your home, or even every room in your home. Because of its water resistance and easy maintenance needs, it’s perfect for rooms with high levels of moisture, and its ability to mimic other materials makes it great for living rooms and bedrooms. Let our style experts help you choose a style of LVF for each room. We carry top-quality brands like Monarch Plank, Castle Combe, Armstrong, Floorcraft, and Somerset.